There are "serious doubts" whether FA bosses are fit to stay on after a "shambolic" performance at a hearing in parliament, MP Damian Collins says. 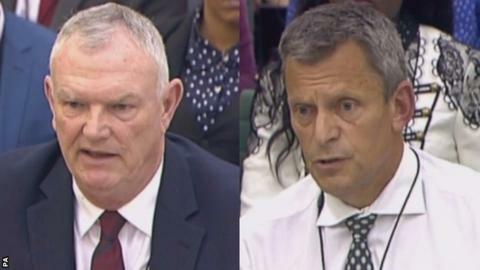 FA chairman Greg Clarke and chief executive Martin Glenn were answering questions after discrimination claims against ex-England boss Mark Sampson. "What the FA wouldn't do was acknowledge their failings," Collins told BBC sports editor Dan Roan. "It raises doubts about whether they are right to take the FA forward." "I think we need to see a real acknowledgement from the FA on their own failings, their internal failings, not just the failings in relation to Mark Sampson," added committee chair Collins. Football Association technical director Dan Ashworth and human resources director Rachel Brace also appeared alongside the pair in front of the Digital, Culture, Media and Sport committee on Wednesday. The government remains concerned about the FA's handling of the case, BBC Sport understands. Sports minister Tracey Crouch called it "a mess" last month. Former FA chairman David Bernstein said the events were "an accident waiting to happen". Bernstein, who stepped down in 2013 after three years in the role, told BBC Radio 5 live: "Within the last 12 months there has been a debate in parliament and they came up with a vote of no confidence in the FA. When there was a chance of really serious reform, the FA came up with some minimal reforms, which were unfortunately accepted. "We've missed a major opportunity. The whole issue of the size and make-up of the FA Council, the independence of the FA board and the shareholding structure hasn't really been dealt with. "These are absolutely key things. It's the old thing of the fish rotting from the head. The organisation is still institutionally locked in the past." Former England and Manchester City winger Trevor Sinclair called for "a complete overhaul" of the FA. "At the moment, they are in the 20th Century. You walk into that boardroom and it represents a gentlemen's club from a couple of hundred years ago. It's an absolute disgrace. It doesn't represent the members or players," Sinclair told BBC Radio 5 live. "For me as a member of the FA, I'm pretty disgusted with what's gone on. I feel people need to be accountable. Action needs to be taken. You need independent bodies to come in and have a thorough investigation." Senior figures at the FA were in parliament to answer questions over their investigation into claims made by England and Chelsea Ladies striker Eniola Aluko against Sampson. Aluko initially made her claims in 2016 as part of an FA inquiry into its management culture. The 30-year-old accused Sampson of belittling her, making racist remarks to both her and a team-mate. Aluko also said she suffered "victimisation as a result of reporting discrimination". Sampson, 35, said his conscience was clear, and denied being a racist. He was sacked in September after evidence of "inappropriate and unacceptable" behaviour with female players in a previous role. Prior to the hearing on Wednesday, the FA issued an apology to Aluko and team-mate Drew Spence in light of new evidence surrounding race remarks made by Sampson. An independent barrister, Katharine Newton, ruled Sampson made unacceptable "ill-judged attempts at humour" on two occasions to the players. "Eni Aluko had to wait 18 months to get a proper answer to the very serious allegations regarding racism and bullying that she brought against the FA," added Collins. "The reason she had to wait so long was because of failures at the FA to investigate them properly. "What we know now stands massively at odds with the impression the FA sought to present over the summer that this had been a rigorously run process, completely fair and there was no evidence of wrongdoing. "That wasn't true and we were right to question the people who sought to lead us in that direction and away from the truth." What did the FA say during the hearing? FA chief executive Martin Glenn issued the initial apology to Aluko and Spence on behalf of the FA at the beginning of his stint in front of the MPs. He then defended the FA, saying it "went about it with the right spirit". When pressed on whether the FA had failed in their duty of care, he said: "There have clearly been failings. I wouldn't want to then say the organisation is failing. "We have 900 members of staff. On balance I think we do a good job." Clarke said: "That is a fundamental breach of our duty of care for that person and I feel very bad about that." The FA chairman also accepted criticism around the recruitment of Sampson in 2013, saying: "What should have happened was a process of due diligence - which does happen now - but did not happen then." He said there had been "systemic, historic failings" at the FA and added: "When I took the job, there was one other decent applicant. I'm willing to risk my reputation to make it better. If it doesn't get better, it's my fault." Some evidence given to the select committee by Clarke has been questioned by the head of an anti-racism group. Clarke told the committee hearing he asked Kick It Out chairman Lord Herman Ouseley for help when investigating the discrimination claims against Sampson. But Ouseley said he was never contacted by Clarke about the matter. "He never ever asked me for advice," Ouseley told BBC Radio 5 live. Clarke told the committee: "The first thing I did when this happened is I went to see Herman Ouseley. I said 'Herman, you're an expert in whistle-blowing, what should we be doing?'. He came in and met with Rachel [Brace] and said these are the things you should be thinking about." Ouseley, however, said: "No-one knew anything until in August this year, when it broke. When I heard of that I suggested to the FA what they could do to resolve that quickly - they didn't want to know." Aluko's England team-mate Lianne Sanderson, who also gave evidence, told 5 live that the FA's performance at the hearing was "shambolic". "The FA is so huge, one of the biggest football organisations in the world and we just need and expect more," she added. 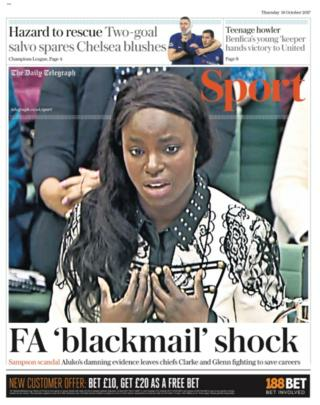 The Daily Telegraph lead with Eni Aluko's suggestion that it was “bordering on blackmail” after she alleged she would only receive the second part of her settlement payment if she agreed to release a statement saying the FA was not "institutionally racist"